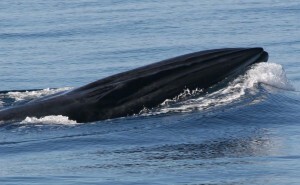 Bryde’s whales are found year-round along the northeastern coast of New Zealand with resident whales in the Hauraki Gulf (Wiseman et al. 2011). The greatest threat to the whales in the Hauraki Gulf is ship-strike mortality (Behrens 2009) and the species is listed as critically endangered in NZ waters (Baker et al. 2010). We recently used multi-sensor DTags to understand the whales’ sub-surface behaviour and found they spend the majority of their time just below the sea surface, vocalise only occasionally and have different activity patterns day and night (Constantine, Aguilar & Johnson 2012). Our research on ship-strike is ongoing and will involve full post-mortem examination of dead whales to determine the cause of mortality (run by Dr Stuart Hunter – Vet School, Massey University and Dr Craig Pritchard – NZ Centre for Conservation Medicine). Dr Emma Carroll, post-doctoral scientist, is making excellent progress with the use of genetic tools to understand whether there are seasonal influences on whale diet and their preferred prey. 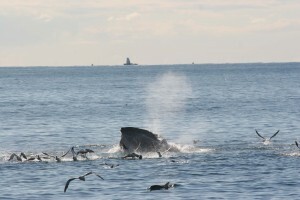 This work uses high-throughput gene-sequencing techniques to determine whale diet and the zooplankton community ecology in the Hauraki Gulf and we can clearly see differences in whale diet from the background water samples. This research is in collaboration with Assoc. Profs Mary Sewell and John Zeldis (NIWA). We will continue our programme of aerial surveys to understand Bryde’s whale distribution. Over the next three years we will gave an updated population estimate of these whales and spatially map prey distribution, inter-species associations and whale density throughout the Hauraki Gulf region. This research is part of the larger Hauraki Gulf Mega-fauna Project and is being conducted by Olivia Hamilton for her PhD and Lily Kozmian-Ledward for her MSc. in collaboration with Assoc. Prof. Rachel Fewster (Department of Statistics), Dr Leigh Torres (Oregon State University) and Dr Cameron Walker (School of Engineering).